Sophie Quire’s life has always been mundane to put it best. She has often dreamed of action and adventures, like the ones in the books she has read and repaired. 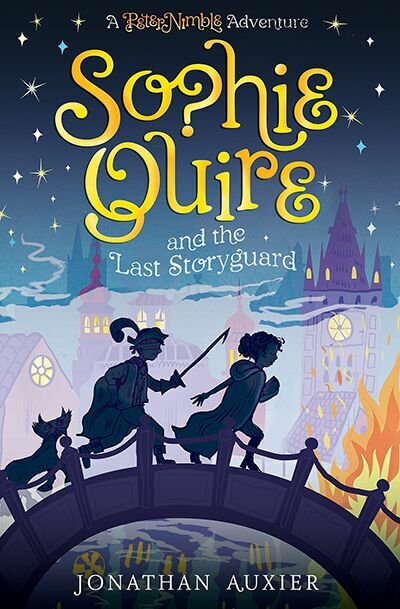 But, when adventure comes in the form of a blind boy (Peter Nimble), his hexed friend (Sir Tode) and an old, decrepit book, Sophie isn’t sure if she’s ready for it. Sophie is tasked with repairing the book only to find out that it is magical. The book is called The Book of Who and possesses the ability to answer any question that begins with the word “Who.” Due to it being a magical book, it is very sought after. Sophie has to protect the book from those who want to use it for evil. Will she be able to protect her book? I enjoyed all of the characters that were described as being at the Last Resort, which was an inn that Sophie went to. They all sounded interesting and unique. I especially loved the Siamese twins. Although they had no dialogue, I found the description of them very interesting and I wanted to know what brought them to the Last Resort and what stories they had to share. My favourite part of the story was when Sophie went to ask Madame Eldritch, a shopkeeper, what she knew about the Book of Who. Sophie believed that Madame Eldritch would be able to help her on her mission to protect the book, but instead Madame Eldritch tried to steal it from her. In order to protect the book, Sophie threw a bottle of sprites at Madame Eldritch which unleashed the creatures onto the shopkeeper allowing Sophie to get away. This is great book for anyone who enjoys action and adventure books. I had read the first book, Peter Nimble, and enjoyed reading more by this author. However, you do not need to have read the Peter Nimble first to enjoy this book. Review by Connor, age 15, grade 11.